People born specifically on the 1st of July are believed to be spirited, generous and kind in nature with a large amount of the usual crab emotional fragility. The ruling astrological planet for this particular day is our Sun making you likely to think fast on your feet and be very decisive. If you have this birthday your enterprising, adventurous determined temperament tends to strive for perfection. Shrewd with an incredible memory and razor sharp intuition you can also be occasionally volatile and impulsive causing you to sometimes say or do things you may regret later. Despite this you possess a genial, outgoing outlook and humanitarian attitude directing you to be naturally loving and protective. Individuals with a July the first birthday greatly value their independence yet desire security and continuity and usually form strong bonds with others. You are insightful and imaginative, openly expressive and always full of original ideas. A career in the caring sector is a popular choice to a person born on the first of July due to your high level of consideration for others. Your natural intuitiveness and ability to take and stick to quick decisions is coupled with a good head for business. These instinctive talents usually allow you to choose a personally satisfying job and as a rule stay in the same profession for many years. Your yearning for stability in life guides you to be careful with finances and unlikely to consider risky financial gambles. You are skilled at household budgeting and will rarely try to live beyond your means. For a Cancer, the person born on the first day of July is typically a little idealistic in their view of romance and soon disillusioned about affairs of the heart. You like to be seen as independent and have a craving for freedom but your need for affection and dislike of solitude drives you to seek a special soul mate. However you are well aware of your vulnerable emotions and may sometimes try to hide your true feelings for fear of being hurt. Sharing everything in a long term relationship is a very important essential and you need it to be harmonious to prevent moodiness and feel secure and settled. In the bedroom your sensitivities encourage you to be a sensual, tender and passionate lover. You generally put a partner first in and out of bed but you are also inclined to express jealousy easily as your pride is sensitive and so soon wounded. Illness experienced by those born on July may be a consequence of your proneness to indulge or deny your appetite depending on your current mood. You can be a bit inconsistent in your food intake and this could increase your susceptibility to viral infections and evoke probable fluctuations in energy. Exercise offers you multiple benefits, it will help keep you in shape and be especially healthy for mind and spirit. People born on this day are once in a while prone to brooding about problems and concealing worries. This should be avoided as it is often a trigger to irritability or depression. Your main strengths of character are displayed in your profound determination and skill at memorizing and recalling knowledge. These fortes and your positive insight and geniality destine you to be mostly successful in all you attempt to do. Personality weaknesses for those born on July 1st are usually a result of your tendency to overly react if your ego is even slightly injured. In these circumstances you could display irritable and short tempered behaviors. Another weak trait is your streak of impulsiveness as its random appearances and intensity can be difficult to predict or control. 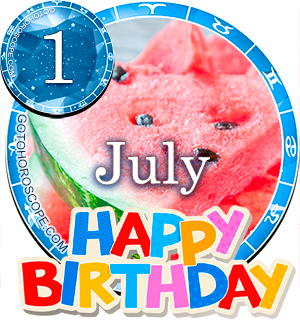 Being born on the 1st of July usually bestows you with modest ambitions professionally alongside an avid wish to succeed in your private life. Your decisiveness helps enormously with the setting of achievable goals and your sense of adventure is a motivating assistant to accomplishing them. If you find yourself with any free time you often enjoy nothing more than helping others to achieve their worthwhile aims. Dreams appear to focus on happiness and contentment within a family atmosphere or envisioning surrounding yourself with beautiful things. Your desire for children is another prominent aspiration. As you were born on the first day of the month your birth date digit grants you a Root number of One. This numerical reference to your birthday has the keyword 'Drive' pinpointing abundant motivation as your primary driving force. The 1st card in the Major Arcana Tarot deck illustrating the Magician is associated with your birthday. This identifies your intuitive side, understanding intellect and fine qualities of diplomacy and kindness. The lucky gemstone for July the first birthdays is imagined to be a red Ruby. Wearing this specific jewel promises to promote positivity and counteract negativity. The probabilities of Cancer personalities are thought to be predominantly influenced astrologically by the power of our Moon. The actual day you were born on, the first of July is ruled over by the Sun's influence explaining your added expressiveness and care, concern and protection of others. Your generosity and astuteness is a fabulous match for your helpfulness and warm emotional bonding. Your inventive imagination allows you follow your instincts with some confidence and enhances your zodiac sign originality. If you can manage to be a tad less self conscious you should develop more resilience and wisdom bettering your chance to progress. A final advantageous thought for people born on July the 1st is to learn to balance more equally your willingness to give and take. Doing so should lessen stress and make you somewhat happier. It time for an update on this site... what do you guys think? Born on the first 1987 . Its true what it says here, however here is my story of my life to share a bit of the reality of what could happen to anyone. I sort have lost my self though .. I am not the same as I was when I was 17 with so much eager to goals and so motivated on working out and doing sports . And also on the love part totaly lost it . What happened ? This crab now is more shy and lazy, negative, no motivation , to much envy glances that I have gone through since my youth from people surrounding me , first I was a model and totaly sophisticated and also doing TV commercials and acting all the suddenly my dreams and life were gone from night to day I didn't want to pursuit my most wishful dream .... ?? It was like my whole mind and heart changed without any explanation and now I feel the life I am right now is the one I should be at or perhaps at th level I should be at. Maybe you should work on finding your "Real purpose of life" because living without any purpose lets you nowhere and and i am sure you will feel more enthusiastic and lively one day good luck! Wow. So relates to me, everything here is true, but like a lot of other people said: I'm shy, I'm really shy. Go 1st of July people, WE RULE. I love music. I want to be famous. Am I being stupid? Everything said here is damn right about me from the passion for profession to freedom to the love life and even to the extent of being intuitive naturally. JULY 1 born, LET'S TAKE CHARGE AND DOMINATE!!! Wow! All of this is so true about me! Born 1984 on Canada day! Spot on. I don't believe in astrology or horoscopes so very impressive. Thank you. All of this is true and I also agree with all the other persons who have said the only thing missing is being shy and introverted. However it does mention the need to be less self conscious so maybe that's what they are referring to. Everything Said Here Are True And Are Relate To Me,but Am Always Shy Whenever Am In The Midst Of People I Know And People I Don't Know.Wow I Luv This.Today Is My Birthday. wow so so true, I can't even an imagination. Wonderful, I'm so surprised wow wow. Wow so so true, I can't even an imagination this! I don't know that some mini gods know me better than myself... I am that big fool always shy esp. when in midst of crowd or people I had never met before. I couldn't have believe this if I had not experiences it on my first day in class in University... So am that big shy booooo... Everytin said here abt me is true, nothing but the truth. A lot of the things being said here are true. In fact, the same applies to a friend whom I no longer talk to. Woww! I could relate soo much to many things written here! The only thing that was a bit off was the assumption that 1st of July-ers are very outgoing/impulsive, because it is completely opposite to me! I overthink everything and am very shy... But other than that.. wow!